I'm an iconoclast [*]. Whenever things become holy, whereby any disagreement is treated as heresy, then I disagree. There are two reasonable sides to every argument. When you vilify one of the sides in the argument, then I step into defend them -- not that they are right, but that they are reasonable. This makes many upset, because once a cause has become Holy, anybody disagreeing with orthodoxy (like me) is then, by definition, a horrible person. I get things like the image to the right. 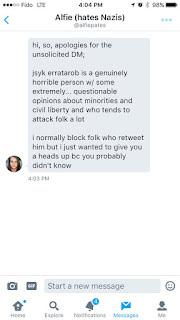 (Please don't harass/contact this person -- she believes what many do, and singling her out would be mean). 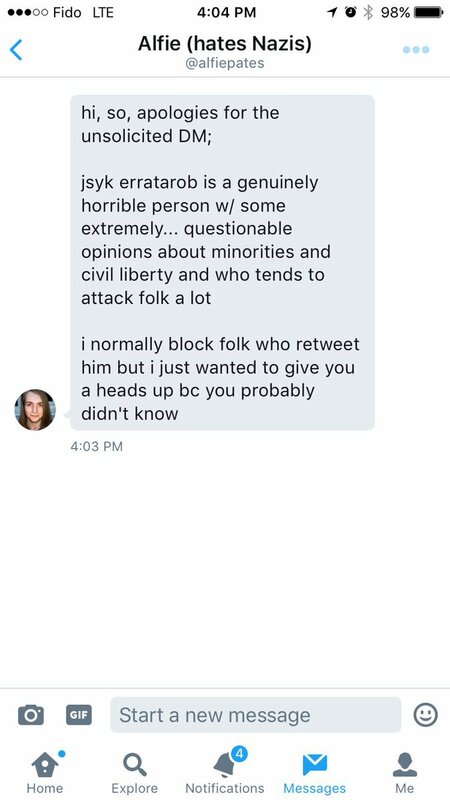 For the record, I'm rabidly feminist, anti-racist, pro-LGBT, pro-civil-rights. It's just that while I care a lot, I'm not Orthodox. I likely disagree with you about the details. When you vilify those who disagree with you, I will defend them. ...which is the best troll, ever. Admitting somebody is wrong, but defending them as reasonable, seems to upset people more than just arguing the other side is right. Maybe hide his identifying details /username in that image to avoid him getting harrassed? But what happens when one side is not reasonable? "I'm an iconoclast [...] I'm rabidly feminist, anti-racist, pro-LGBT, pro-civil-rights"
And what happens when the side that believes to be reasonable is actually the one not being reasonable? Maybe you have the magic god truth that will solve all the problems on the earth. It will be so easy, can't wait to learn from you. Yes, that is clearly what I meant. Rob is my favorite troll. That reminds me of a quote I heard once and have tried to always keep in mind. It is something like this, "Everyone does what makes sense to them at the time." In other words everyone thinks they are doing what is reasonable. I think in trying to understand them from their perspective, then we become more human.